Moon flowers (Ipomoea alba) are tropical perennial vines. They can not tolerate frost and for this reason they are used as summer annuals in northern climates. This is a sturdy and very fast growing climber that actually likes the summer heat. They are sometimes known as moon vine or evening glory because they flower at night. Moon flowers are closely related to the morning glory and have similar growing habits but on a larger scale. Their heart-shaped leaves can grow up to 8 inches long. The plants produce many branches and several buds per stem, but usually only one blossom from a group opens at the time. The pure white delightfully fragrant flowers are a huge 5 to 6 inches in diameter and open in the evening - a stunning sight on a moonlit summer night. Individual flowers only last one night and collapse by morning. Moon flowers are generally started from seed but can also be propagated by tip cuttings or runners that form naturally on the plant. Be sure to provide sturdy support such as a fence or arbor where they can climb unrestricted. Keep in mind that individual plants can attain heights of 18 feet or more. They make perfect screens to cover ugly outbuildings or to deter nosy neighbors. Because soil temperature must be warm for successful germination, wait until weather warms and night time temperatures are around 60. Prepare the seed by soaking overnight, then plant about 1/2 inch deep. If conditions are right, seedlings should begin to appear in a week to ten days. Moon flowers will grow in ordinary garden soil, but for lush growth they prefer rich moist and well drained soil improved with compost. Sow seeds where plants are expected to grow about six to eight inches apart. Select a spot that receives full or partial sun and is protected from high winds. 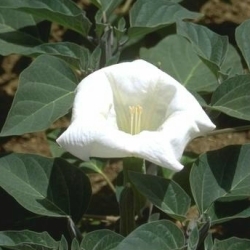 Once established, moon flowers require little maintenance and fertilizer is usually not required unless they are planted in poor soil. A good layer of mulch helps to prevent weeds, retain moisture and keeps soil temperatures even during the heat of summer. Pollinated flowers will produce large pods filled with many seeds. Let these dry on the vines, then pick and store for planting next season. Spice jars make excellent containers. Just leave the lids off and the little perforated top in place for air circulation.